IAME Winter Cup – Sunday: Slater, Bearman, MacDonald & Benavides join the winners’ pantheon! 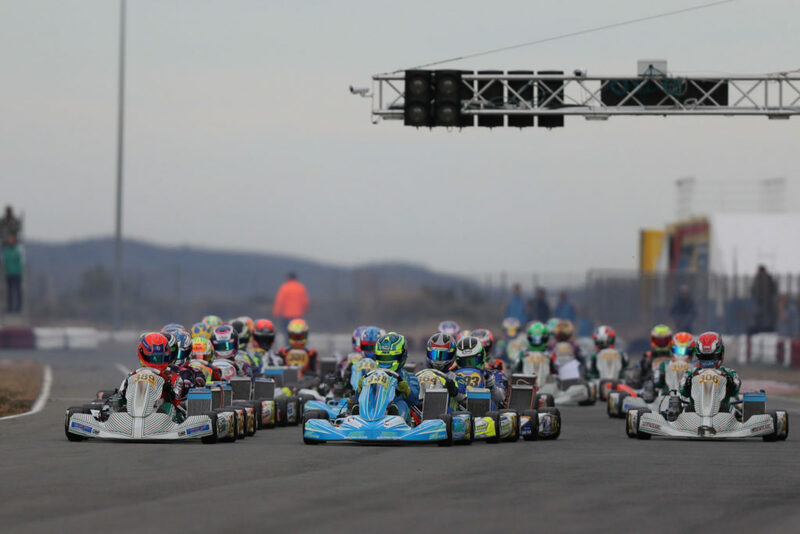 The Kartodromo Valencia has rumbled this Sunday for the conclusion of the 2019 IAME Winter Cup! At the end of the four Finals, audiences following the action on location and through Live streaming have witnessed the triumph of Freddie Slater (Mini), Oliver Bearman (Junior), Dean MacDonald (Senior) & Brad Benavides (Shifter) in a successful third edition of the event organized by RGMMC! 389,Macdonald Dean(N/A),Strawberry Racing 1(TONYKART/X30/MG), 338,Leedmaa Siim(EST),Aix racing(EXPRIT/X30/MG), Valencia, 10 February 2019. IAME Euro Series, © 2019, Alexandros Vernardis / The RaceBox. Freddie Slater has concluded his weekend in Valencia as he had entered it: in front! Already fastest of them all in Friday’s Qualifying, the British driver went almost unbeaten through Saturday’s Heats (two wins out of three) before winning the Prefinal on Sunday morning. Leading a Fusion Motorsport 1-2 on the front row with Leo Robinson, he jumped on the gas at lights out ahead of his fellow countryman, Tiziano Monza (Team Driver Racing Kart), Juan Cota (Kart Republic Spain), and Alberto Hurtado Gonzalez (BRT). If Slater kept himself out of trouble to dominate the ten laps of the race, the fight for the podium quickly saw Monza, Robinson, and Cota going wheel-to-wheel against each other. Off the podium at one point, Monza fought his way back to get past his opponents in the last lap and crossed the finish line only 0.5 seconds off the victor. Robinson completed the top 3 in front of Cota and Adrian Benito (Praga Espana Motorsport). 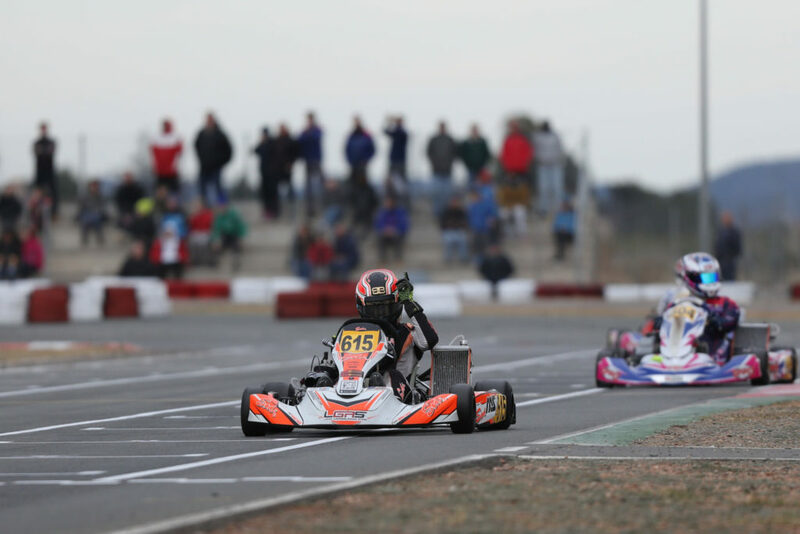 Following in the top ten are Denis Curavale (EKR Factory Team), Edu Lliteras (Fusion Motorsport), Sebastiano Pavan (Team Driver Racing Kart), Hurtado Gonzalez, who fell off the top 5 halfway through, and Vinnie Phillips (Fusion Motorsport). Click here to consult the complete classification. 927,Slater Freddie(GBR),Fusion motorsport(KART-REPUBLIC/X30/KOMET), Valencia, 10 February 2019. IAME Euro Series, © 2019, Alexandros Vernardis / The RaceBox. Another driver from Great Britain who seems to have found his feet around the Kartodromo Valencia is Oliver Bearman (KR-Sport). 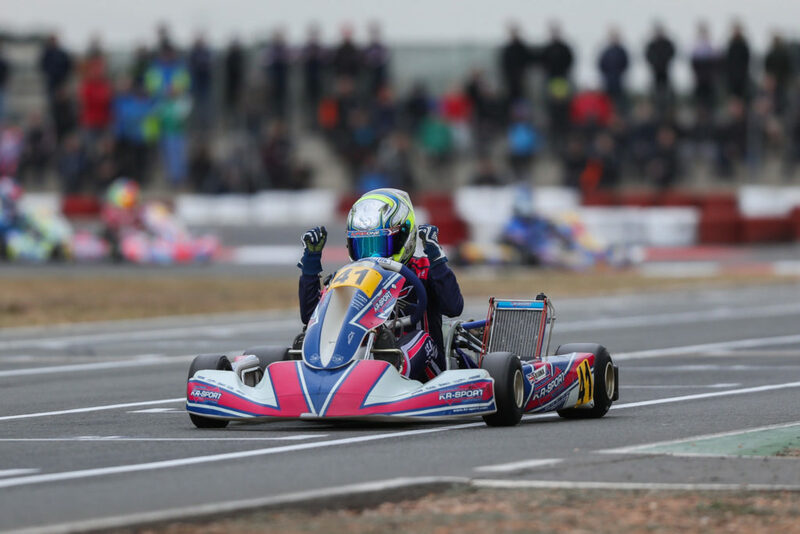 The young Brit was the man to beat among the Juniors this weekend, right from Friday’s Qualifying where he pulled off the fourth-fastest lap to Saturday where he claimed the provisional ranking after winning his three Heats. But the opposition was still operating in the shadow to give him a hard time on Sunday. After winning the Prefinal for a tiny gap on Josh Rowledge (Strawberry Racing), Bearman had the best getaway start at Turn 1 in front of Joseph Taylor (Coles Racing), Douglas Bolger (Fusion Motorsport), Rowledge et Oli Pylka (Dan Holland Racing). The opening stages of the Final quickly turned into a showdown with the lead position jumping from hand to hand, sometimes in the same lap! At the halfway mark, Taylor was leading ahead of Bearman, Rowledge, Alex Ley (Coles Racing), Pylka and Miguel Peiro Luzarraga (FA Racing Spain). The Spaniard, who was closing in fast after a missed start had sent him from 5th to 21st in one lap, made his move on Rowledge for P3 (lap 9) before contact sent him back to 7th. On the same lap, Bearman launched his attack on Taylor to take the lead until the chequered flag. Second on track after starting 13th on the grid, Alex Ley wasn’t eventually rewarded for his recovery race after being handed a ten-second penalty for what was considered a ‘bad maneuver’. He was classified 19th overall. Josh Rowledge recovered the second place in front of Oli Pylka, Joseph Taylor and Oliver Gray, 5th at the flag after starting 33th on the grid! Ruben Volt (DHR), Zacharias Ripley (Evolution), Ken Oskar Algre (Aix Racing Team), Liam McNeilly (Evolution), and Maximus Mayer (Fusion Motorsport) completed the final top ten of the weekend of which Kris Haanen (Coles Racing) fell short because of a 5-second penalty for a wrong front fairing position. 41,Bearman Oliver(N/A),Kr sport(KOSMIC/X30/MG), Valencia, 10 February 2019. IAME Euro Series, © 2019, Alexandros Vernardis / The RaceBox. As for his two fellow countrymen Slater (Mini) and Bearman (Junior), Dean MacDonald hasn’t missed either the opportunity to make the Union Jack colors shine above Valencia. The British GT driver was left with barely any opposition on Sunday as he quickly built on a gap from Pole to control the race from start to finish despite the pressure rising from behind at some point. Unbeaten in Qualifying, in the Heats and in Sunday morning’s Prefinal, Strawberry Racing’s leading man crossed the line 2.2 seconds ahead of Joe Turney (KR-Sport). The reigning IAME International Final winner made without a doubt the most-spectacular recovery of the Winter Cup. Kicked out of the top 28 after Saturday’s Heats, he was forced into the “Second Chance Heat” concluded in a 4th place to be granted a ticket for the Prefinal. From 32nd on the grid, the British driver then cruised through the field at the pace of a cannonball to finish 5th and access the Final to eventually step on an almost-unexpected podium. His teammate Clayton Ravenscroft finished on his tail but had to make do with third place, one year after his success in the same class. Siim Leedma (Aix Racing) concluded his Sunday with 4th, followed by Morgan Porter (M Sport) and Mari Boya (Monlau Competicion), both having recovered four places. Joey Van Splunteren (Super B), like Turney, came all the way back from the bottom after missing out on the top 28 on Saturday. 13th of the Prefinal (from 20th on the grid), the Dutchman got past six other drivers to finish 7th overall in front of Filip Vava (KR-Sport), Louie Westover (Dan Holland Racing) and Jordan Brown-Nutley (Strawberry Racing). 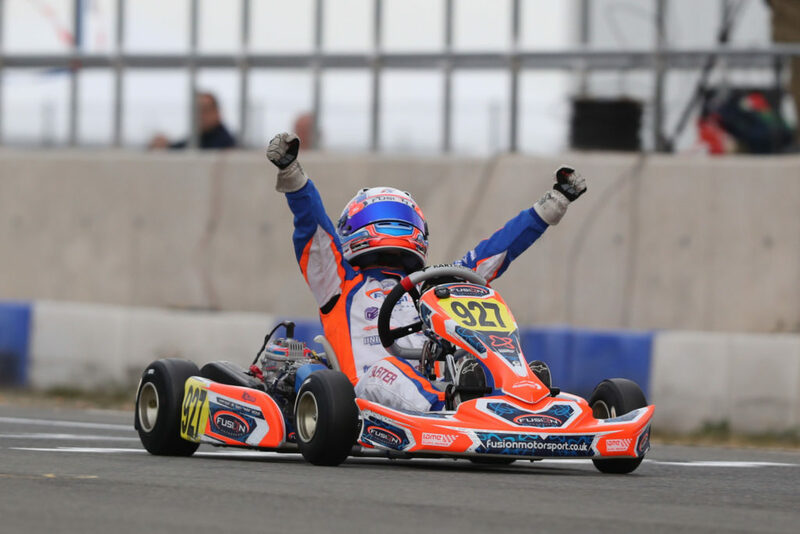 389,Macdonald Dean(N/A),Strawberry Racing 1(TONYKART/X30/MG), Valencia, 10 February 2019. IAME Euro Series, © 2019, Alexandros Vernardis / The RaceBox. Often spectacular, the Shifter Final kept its promises in dramatic fashion this Sunday! Following a strong weekend that led him to Pole position after a win in the Prefinal, Kaspar Korjus (Aix Racing Team) was caught in contact right at lights out when Carlos Leon (FA Racing Spain) jumped from the second row to challenge the Polesitter on the way to Turn 1. But wheels touched and Korjus was sent out in the barriers just a few meters away from the starting line! An early drama that allowed Saturday’s leader Carles Martinez (Praga Espana Motorsport) to pull away in front of Thierry Delré (Delré Racing / Mach1 Motorsport), Kevin Lüdi (Spirit-Racing) and Philipp Seewer (Spirit-Racing), who gained seven places in one lap. Two rounds later, Delré went ahead Martinez, as did a fast-recovering Brad Benavides (Campos Racing) passing Lüdi for P3. The Guatemalan kept his momentum high to take the lead from both Delré and Martinez, not long before the latter was forced to retire due to a technical issue. At the front, Brad Benavides controlled his gap on Lüdi to be named the winner of this year’s Winter Cup in the Shifters. Lüdi finished in second place with the podium completed by Seewer, followed by Leon, Delré, Michel Biffiger (Spirit-Racing), Vasco Oliveira Lazaro (Cabo Junior Team), Laurent Malice (Delré Racing / Mach1 Motorsport), David Rehme KH-Racing) and Joao Dias (Spirit-Racing). 615,Benavides Brad(N/A),Campos Racing(SODIKART/X30/MG), Valencia, 10 February 2019. IAME Euro Series, © 2019, Alexandros Vernardis / The RaceBox. 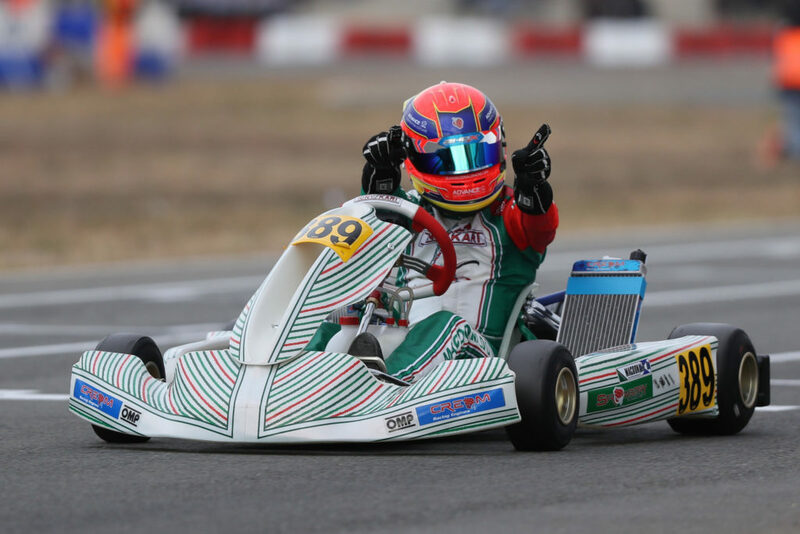 The next stop of the 2019 IAME X30 season will take place from March 29th to 31st on the Karting des Fagnes of Mariembourg, in Belgium, to kick off the IAME Euro Series. An event that you will be able to follow on our website thanks to a special page featuring Live Streaming (by Telemundi Media) and Live Timing (by Apex Timing) as well as our reports published every day to keep you up to date with the results.